Call of Duty goes fully multiplayer, with extra focus on PC. The rumours are true: the traditional Call of Duty singleplayer campaign is dead. There’s no lavish, indulgent six-hour collection of cinematic story missions in Black Ops 4. Now the story is threaded into multiplayer, the mode that, let’s be honest, is the real reason that fans of the series keep buying it year after year. It’s a bold, and perhaps inevitable, move by developer Treyarch, but for the veteran Call of Duty studio it’s just another way of telling a story. The PC version will have support for HDR, native 4K and ultra-wide monitors. The combat has been tweaked to accommodate a mouse and keyboard (for instance, a faster, snappier camera while using one of your character’s special abilities). Black Ops 4 will also be joining Destiny 2 as the second non-Blizzard game to find a home on the Battle.net online service. It’s nice to see Treyarch ensuring the PC version is up to scratch; it will have to be if the studio wants this to be a game which people play for years to come. With so many great competitive online games available on PC right now, some of which don’t cost anything to play, Treyarch has a tough fight ahead of it. Perhaps the most significant, and least surprising, new addition to the series is Blackout. Yes, it’s a battle royale mode, taking place on a map Treyarch describes as being a thousand times larger than a regular multiplayer map. How do you translate the fast, claustrophobic combat associated with Call of Duty to such a huge expanse? “It’s been a different and new challenge,” says Bunting. “But as we’ve been working on it, we’ve have a lot of ideas and cross-pollination between different parts of the game. We’ve brought stuff to multiplayer that we learned making Blackout, and vice versa. Blackout will feature land, sea and air vehicles, and will incorporate weapons, abilities and characters from the series’ history—including Mason, Reznov and the cast of the Zombies mode. I like the idea of these different universes colliding, although Blackout is clearly early in development. Treyarch had nothing to show me besides a teaser trailer, and it’s unclear how it plans to make its mark on the battle royale genre. It promises the team is doing battle royale “the Black Ops way”, which doesn’t really mean anything, but gives a sense that perhaps it wants to shake the format up a bit to stand out from the crowd. You’ll no longer magically heal when you crouch behind cover. Instead, you have to patch yourself up manually. You’ll no longer magically heal when you crouch behind cover. Instead, you have to patch yourself up manually, which seems like a small thing, but makes Black Ops 4 feel markedly different from previous Call of Duty games minute-to-minute. A fog of war system has also been introduced, which will quietly force players to work together. “Situational awareness is an important part of our game,” says Bunting. “Weapons, movement and health are your fundamentals, but you also have to be aware of what’s going on around you. And the fog of war system has opened up a whole new dimension of competitive play. I also found it interesting how Treyarch opened its Black Ops 4 reveal by telling the amassed fans and press that wallrunning and jump jets have been removed from the game. The elated cheers from the fans and pro players in the crowd suggests this is something people are glad to see the back of, and it’s a frank admission from Treyarch that it didn’t really work. “Boots on the ground” was mentioned a lot and the developer also showed off the fact that your gun is always up and ready to fire, even when you’re throwing grenades and mantling over obstacles, which was met with a similarly positive response. Changes like this won’t mean much to casual Call of Duty players, but for the lifers who play nothing else, they’re tweaks that are both major and welcome. Specialists return to Black Ops 4, each offering a unique way to play the game. Fans of the series will recognise some favourites sitting alongside the fresh faces. I enjoyed the new take on beard-and-tattoo aficionado Ruin, who can now zip around the map with a grappling hook. It feels very much like Treyarch’s take on Widowmaker from Overwatch’s similar ability, and I loved using it to grapple away from trouble when I was near death as the enemy looked on hopelessly. It’s elements like this that makes Black Ops 4 feel much more dynamic and fun than previous Call of Duty multiplayer offerings, and it feels like the Treyarch team has been playing plenty of Rainbow Six Siege and Overwatch for design inspiration. As for the new operatives, they’re an interesting bunch. “Torque is an expert in lane control,” explains Bunting. “He can drop a barricade anywhere in the environment and use it as portable cover. But where it’s most effective is blocking lanes. It’s a sort of active denial system, creating heat and distortion effects for players who come near it. He also has razor wire that you can use more frequently. Players can walk through it, but it does damage and slows them down significantly. He brings a layer of tactics to the game that are all about controlling lanes and controlling the fl ow of a match. “Ajax is the shield guy. He’s essentially a movable piece of cover, and when he gets his shield out he’s a force to be reckoned with for anyone on the other side of it. He has a little gun port that he can fire safely from, and he can wreck the place with that. He also has a nine-bang fl ash grenade, and the longer you cook it, the longer it fl ashes. So you can blind the enemy team, then your teammates can come in and use you for cover. “Recon is our situational awareness master. He has abilities called Sensor Dart and Vision Pulse that reveal the locations of enemies to the whole team. Then there’s Crash, the combat medic. He can heal and buff his teammates, and he’s a good example of how we’re not forcing teamwork, but helping players help each other. Everything you do benefits you, but if you do it well, you also benefit everyone else." Finally, yes, Zombies mode is back. 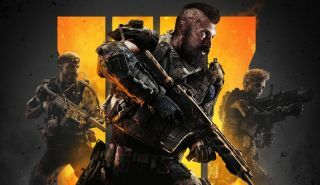 What began as a bonus extra in the first Black Ops has become an elaborate, fully-featured mode with its own pulpy mythology, and Black Ops 4 will tell a new story in this universe. The game will come with three missions involving time travel, seeing the four new heroes hopping from what looks like Ancient Rome to being aboard the Titanic before it slams into an iceberg. The fusion of real history and occult mythology should provide a compelling backdrop for all the zombie slaying. The over-the-top, grindhouse-inspired tone from previous games is firmly intact in this new tale, and it’s so different from the macho military feel of the rest of Black Ops that it almost feels like a separate game. As stylish as this all is, however, Treyarch has yet to reveal any concrete info about how the new Zombies mode actually plays, or how different it’ll be from previous iterations. I do like the sound of the new customisation options, which let you create custom matches to share and play online, adjusting how the zombies behave: their speed, health, aggression level and so on. ‘Replayability’ is one of Treyarch’s favourite buzzwords, and customisation like this is a part of achieving that goal. Black Ops 4 doubling down on multiplayer is completely unsurprising. Some will miss the traditional, linear campaign, but most of the fanbase won’t care. Treyarch is clear that it wants this to be an ongoing game-as-a-service, retaining players for several years. Its success on PC is an unknown quantity, especially with games like Overwatch to contend with, but it’s good to see Treyarch dedicating itself to making the Windows version of the game as good as it possibly can be.